"After Murphy attends a sexual harassment seminar for the 'Murphy in the Morning' staff, she is surprised to find herself reeling from the long-repressed memory of her own #MeToo moment." This episode hearkens back to the episodes from the original show run that tackled pregnancy, difficult family relationships, cancer, and fear of death -- quite a lot of jokes, but quiet, serious conversations too. OK, this episode was better than the season premiere, despite the eye-roll side plot of Miles's tortured interest in one of his researchers. The Frank-Pat side plot* gave me more Pat (even if Pat's much less wise than I'd hoped this character would be) and a hint that Pat is queer, so I liked that. We're finally getting some scenes with good chemistry and dialogue between Phyllis and Murphy, and I thought this Avery-Murphy scene was interesting and moving. 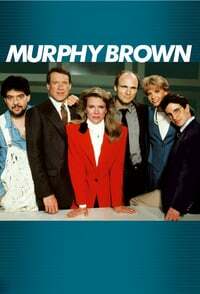 And the core story is a classic, archetypal Murphy Brown story: she denies and struggles with a personal vulnerability, eventually bravely faces it and articulates what hurt her and the effect it'd had, and comes away having rescued a little piece of herself. * I don't know whether the Miles stuff is the B plot and the "App-ropriate Behavior" app is the C plot or vice versa. This was a better episode than the last one about sneaking into the White House press briefing (which was absolutely terrible), but I feel that this show should be further along than it is. It's not that it has to develop these characters from scratch. It should be able to build on the strong foundations and histories that already exist for them. In a lot of ways, it feels like they've reverted or devolved some of the characters (Miles, and Frank in particular) back to their more nascent forms, and not allowed for any personal growth. As for Corkie, I don't think they have a clue of what to do with her or how to use her--or at least they haven't demonstrated that they do. Maybe there's a corker of a Corkie story coming up in episode six or nine, but we shouldn't have to wait that long for her to move away from the sidelines. I can understand the slow build with Phyllis because she's a new character who is just figuring out her own way in her new role as her brother's successor. So far, that part is working. It's just the rest of the show that is floundering. Still not awesome, but I did enjoy knowing that Murphy was gonna get that award back. I haven't watched yet. Has there been /any/ mention of Corky and Miles' relationship? I miss Jim Dial. I think we're seeing that his stiffness was a useful component in the ensemble, giving the more impulsive and passionate characters something to push against. I meant that Dodani was a campaigner, whoops.